The answer is yes. And you don’t even have to rehydrate the fruit first. Just throw everything in the blender, blend, and enjoy. Super simple. This recipe is a great base recipe for your smoothie. 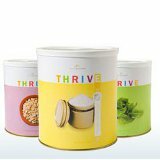 It is the recipe that Thrive Life consultants make at home parties and is easily modified just substitute any kind of freeze dried fruit for the peaches or strawberries and you have an entirely new smoothie. Serving Idea: Top with fresh whipped cream and dust with more drink mix powder or crushed THRIVE Strawberries or Peaches.